Such an adaptive method of thermal insulation in construction is invaluable, with properties that allow for moisture resistance, strength, fire protection, high thermal insulation capabilities and a low environmental footprint – phenolic foam insulation provided by Altrad NSG Limited really does provide a versatile and effective insulation system. Phenolic Foam is suitable across all sectors, from offices and warehouses to petrochemical engineering sites, nuclear plants, off-shore oil refineries and much, much more. We can provide Glass Fibre & Mineral Wool to insulate and protect pipework, tubes and bends as well as flat surfaces. Such insulation makes for excellent thermal heat values and will also absorb sound very well. Glass Fibre & Mineral Wool Thermal Insulation makes for effective fire protection; while not completely immune the structure and chemical properties of the product makes for a good solution where passive fire protection is required. Our thermal insulation structures can be finished in H&V Bright Class ‘O’ – an aluminium foil face or a H&V White Class ‘O’ finished in a white aluminium foil face. Our thermal insulation services are capable of cladding with the relevant material to the job in hand, we can offer metal cladding for sites that require robust thermal insulation, Isogenopak Cladding and Polyisobutylene and Duct Wrap can also be applied depending on the specific requirements of the nature of the environment, and our clients needs. 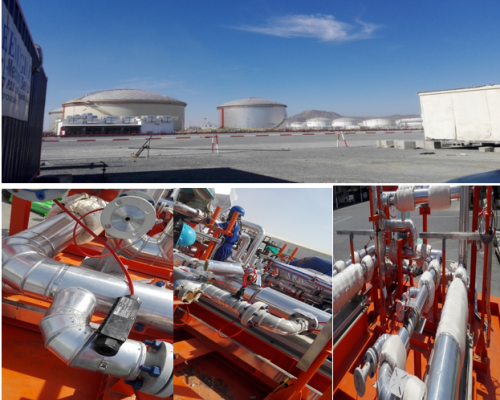 PAkLINK Services has been established since 2004, and provides high-quality thermal insulation for piping and tanks, vessels.and trace heating services for manufacturing, storage and other industrial facilities covering thermal and cryogenic insulation of process pipework, vessels and bulk storage tanks. We also serve the commercial HVAC market, covering thermal and acoustic insulation of pipework, ductwork and equipment. Acoustic insulation – this type of insulation is applied to provide a sound barrier between a noise-generating surface and the surrounding area. We have fully-equipped sheet metal workshops that can manufacture and form virtually any shape required, from flange and valve boxes, to vessel cones and domes. We fabricate and supply all key metals used in the insulation industry, including aluminium, aluzinc, plastisol, as well as galvanised and stainless steel. By constructing our sheet metal in-house, we save you time and money, while ensuring a quality product that meets the highest standards. We also have sufficient machinery to provide us with the capability to set up on-site workshops on our larger projects throughout the Middle East-Asia/AFRICA/ASIA.